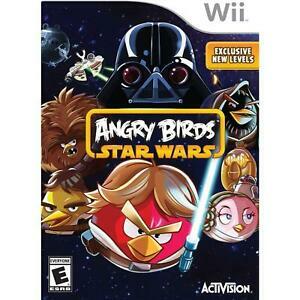 Rovio's killer app joins one of the most popular entertainment franchises of all time in Angry Birds Star Wars. Building off the mechanics introduced in Angry Birds Space, players fire rebel-inspired birds through gravitational fields at empire-themed structures full of Imperial storm pigs. The birds have a variety of new abilities, allowing them to slice through obstacles with a Lightsaber, fire three shots from a blaster, or clear small areas using the Force. The Wii version offers more than 100 levels of action and includes new competitive and co-op multiplayer modes. Great game for such a great price. My son was such a happy little guy when he came home and opened it up! Great game for the children. They love it. Great game! my kid loved it. He does not want to stop playing it! Great game! my kid loved it. He does not want to stop playing it! Something he likes like angry birds combined with some thing I like Star Wars. I'm ok with that any day! Great game! my kid loved it. He does not want to stop playing it! Something he likes like angry birds combined with some thing I like Star Wars. I'm ok with that any day!Great game! my kid loved it. He does not want to stop playing it! Something he likes like angry birds combined with some thing I like Star Wars. I'm ok with that any day!Great game! my kid loved it. He does not want to stop playing it! Something he likes like angry birds combined with some thing I like Star Wars. I'm ok with that any day!Great game! my kid loved it. He does not want to stop playing it! Something he likes like angry birds combined with some thing I like Star Wars. I'm ok with that any day!Great game! my kid loved it. He does not want to stop playing it! Something he likes like angry birds combined with some thing I like Star Wars. I'm ok with that any day! Shipment was timely and product quality was great!